I cannot express the surprise and joy I experienced when I found out that I was to be this year’s recipient of the Eunice Fisher Award. I want to begin by expressing my sincere thanks to the members of the selection committee and The American Hosta Society, and my apologies to all of you for having to put up with me a second time tonight. I never knew Eunice V. Fisher personally but held great admiration for her as a charter member and cofounder of The American Hosta Society and its first secretary-treasurer. She also published the first hosta book that I ever saw, entitled Hostas the Aristocratic Plant for Shady Gardens. Herb Benedict, whom I spoke about earlier this evening, loaned me his mimeograph copy to study. For you younger people, a mimeograph is a stencil duplicator, a low-cost printing press that works by forcing ink through a stencil onto paper. If you were a model student, you could be sent to the principal’s office to turn the crank and print announcements, tests, etc. There was a very wonderful smell from the ink. I knew about the four or five kinds of hostas one could grow. You know the one with white fragrant flowers, the one with dark purple flowers, and some that were green and white. Was I shocked to see her list of cultivars. I had no idea at that time there were so many kinds. Mrs. Fisher cataloged the data of all the hostas she was aware of and their origin. Most of the plants in that publication were selections made from random seedlings in the garden or from garden sports. There were few controlled crosses being done, and Herb encouraged me to try my hand at hosta hybridizing. What Herb and others had been doing was to remove the bloom stalks of most of their hostas, thus restricting the potential pollen plants. He let the bees do the pollinating. This was a step forward, as at least the pod parent was known for certain. As a physician I had studied human genetics in medical school and was fascinated by the potential of planned crosses. There were some outstanding hybridizers doing planned crosses in the early 1980s, including William and Eleanor Lachman and Kevin Vaughn. I firmly believe that the single most important contribution to hosta hybridizing was Kevin’s work on the inheritance of variegation through chloroplasts. It took me a long time to understand this, because it involved the DNA in the cytoplasmic organelles, rather than only in the nucleus as I had been taught in medical school 20 years earlier. My first hosta national convention was in Chesterland, Ohio, in 1985. I remember so well Mark Zilis’s discussion on sporting. He believed that to make significant changes in hostas other than the same plant with various leaf colors, one would have to hybridize. I think that time has proved him to be correct. In The Hosta Journal, volume 21, number 1, (1990) I wrote a paper called “Why Hybridize?” Using 13 hosta plant characteristics, I was able to calculate that the potential existed for over 250,000 distinct cultivars. I was hooked! In 1987 I had authored an article entitled, “Accelerated Growth of Hostas”. This had to do with an accidental discovery. My growing lights were second-hand and often would not restart when turned off, so I left them on for 24 hours. This produced exceptional and rapid growth of seedlings by preventing dormancy. Using this technique, quite often hosta seedlings would bloom in their very first year. In the 1990s, before the Internet was widely used, I started a hybridizer’s round robin in the American Hosta Society. In a round robin the members would respond to other members’ letters, remove their prior letter, insert a new letter and mail the robin on to the next member, who would repeat the process. I was delighted that so many of my fellow hybridizers had already begun to grow their seedlings under 24 hours of light. I also discovered the hybridizers are busy and somewhat disorganized. As a result, our robin rarely made it around. We did meet at the Hosta College, and this round robin morphed into a hybridizers' group, which was ably run by Ed Elslager. Members of this group have taken hybridizing to new levels and regularly share seeds, seedlings, and information and now, instead of snail mail, there is on-line chat. As I mentioned before, Herb Benedict had purchased a number of hostas from Paul Aden in the early 1980’s. Some of them had streaked variegation, and Herb was generous in sharing divisions as these plants multiplied. He encouraged me to develop my own breeding stock, using the streaked plants as the pod parent and various other desirable plants as the pollen plant. For several seasons I had been frustrated growing seeds from Hosta ‘Frances Williams’ and getting only plants that were not variegated. Armed with Herb’s streaked gifts and Kevin Vaughn’s informative writings, I was ready to go. Most of my streaked breeding plants came from ‘Beatrice’, ‘Yellow Splash’, ‘William Lachman’,,and ‘Dorothy Benedict’. As many of you know, streaked plants are notoriously unstable and eventually sort out to become centrally or marginally variegated plants. In the 1990’s the registrar for the genus hosta was unable to register streaked cultivars because of their instability. For the serious hybridizer the parentage of the streaked hostas was very important information. I wrote an article in The Hosta Journal in 1990 called “In Defense of Streaking.” In the late 1990s, just before I became the registrar for the Genus Hosta, we were able to convince the International Registration Authority to allow for the registration of streaked hosta cultivars. He accepted our postulation that the instability of streaked hostas was a stable characteristic. I never felt more like an attorney in all my life. This has, however, allowed the registration of these important breeding plants. My personal goals for hybridizing was to create very large, marginally variegated plants, which were sun tolerant, sturdy and whose flowers bloomed entirely above the Hosta mound. Many of my hybrids had ’Dorothy Benedict’ in its lineage, and I selected pollen parents with long bloom scapes. I feel I have met that goal with ‘Jubilation’ in 2000 . As you know, miniature hostas have recently become the rage. Sadly, many of my large “estate” hostas have not been widely distributed. In addition, they are slow-growing and don’t always look good in a pot. I’m always happy to talk with people about hybridizing, but clearly you would not want to seek my advice on investment trends. Hybridizing has been an awesome hobby. I’ve made incredible friends, nourished my scientific needs, and learned to be more comfortable in writing and in public speaking. I now understand what Herb and Dorothy Benedict meant about seedlings becoming your children. There is pride and joy about watching your creations grow up with its own unique characteristics. A particular thrill for me was to write the chapter on hostas in the timber press book, "Breeding Ornamental Plants," (2000, Dorothy and M. Brett Callaway). I certainly never dreamed that I would be a Hosta Growing God! This is a photo that Olga Petryszyn posted on line: she was not sure of the source. I was born and reared in Ann Arbor, Michigan, the home of the University of Michigan. All of my undergraduate and medical schooling, as well as my dermatology training was at the University of Michigan. My mother was, for many years, the receptionist at the athletic office at the University. Another one of my hybridizing goals was to breed for a plant that was yellow and blue, or as we would say maize and blue – The University of Michigan’s school colors. I have registered a plant called H. ‘Maize and Blue’, which is streaked. I was excited about that, but alas, it is not a great producer of seeds. Oh well! There are other ways to get yellow and blue in the garden. I have come to love the gold and blue juxtaposition of my conifers. By far the favorite yellow and blue thing is a working golf cart, which Sandy gave me for my 66th birthday. I don’t know how we could maintain our garden without it. As many of you know, selecting a favorite seedling is very much like selecting a favorite child. After much thought, the plant that I have selected for the Eunice Fisher Distinguished Merit Hosta Award is ‘Wolverine’. The University of Michigan has taken the wolverine as its mascot. This is of particular interest, since there having been no wolverines sighted in Michigan. H. ‘Wolverine’ is from a planned cross made in 1988 between a fifth-generation streaked seedling of ‘Yellow Splash’ and ‘Dorset Blue’. It was registered in 1995 and is a prolific multiplier. It forms a medium-size clump with a bluish center and yellow variegation on the border. 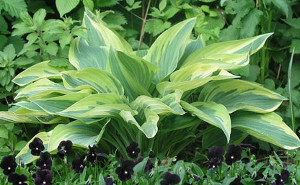 It was particularly enticing to me because it was a lanced shaped variegated hosta when most variegated hostas were round. I was told by a very experienced hostaphile that this lance shape was indicative of juvenile growth, and the leaves would eventually become more round. For the past 20 years I have thanked this plant for acting juvenile. Why would I choose this hosta to be called Wolverine? H. ‘Wolverine’ starts the season looking very good and still looks good at the end of the season. That is how I like both my sports teams and hostas to perform. 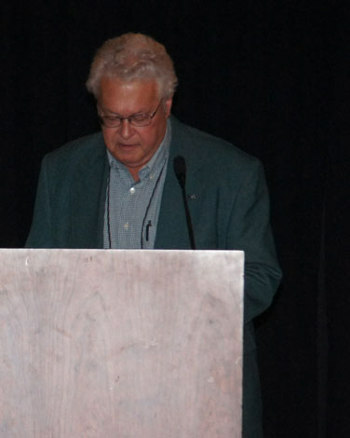 Others must feel the same as I do, as ‘Wolverine’ received an AHS Benedict Garden Performance Award of Merit in 2011. Well, there now is a Wolverine in Michigan and I have even seen it for sale in the archrival Michigan State’s Flower Store. The all blue tissue culture sport of ‘Wolverine’ is ‘Curtain Call’, and it is time for mine. Finally, I end by saying that the joy is in the creating, whether it be gardens, conventions, hybrids, or friendships. I thank you for this honor, and most especially for all the memories! Thank you for sharing your dinner time with me.